Though we as humankind haven’t had a breakthrough in completely treating every kind of cancer or a vaccine in protecting ourselves from it, if we are alert enough, there is every possibility of catching hold of it at an early stage so as to treat it well before it goes out of control. One such cancer type is throat cancer. As goes its name, it is the cancer of throat and affects the pharynx as well as the larynx or voice box. While the pharynx is located above the esophagus and larynx and below the nasal cavity, the larynx is located in the front of the neck. 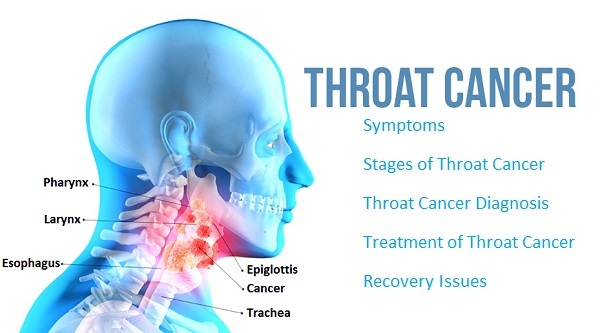 There are three different stages in throat cancer. If detected at an early stage throat cancer is pretty much treatable with surgery and radiation. The levels of throat cancer are spread across four stages 0 to 3. Stage 0 – This is the earliest stage of caner wherein the tissue isn’t affected any other areas except your throat. Stage 1 – The cancer has not affected any other areas beyond the throat but the size of it is less than or equal to 7 cm. Stage 3 – The cancer has spread upto nearby organs and tissues. For diagnosis the doctor or oncologist may ask to do a biopsy or a fine needle aspiration. The biopsy recommended could be either a conventional biopsy or an endoscopic biopsy. The doctors would further recommend a few tests for determining the stage of your cancer. These include CT scan, PET scan or a MRI test. The treatment would be typically based on the stage of the cancer. It could include removal of the tumor and radiation and chemotherapy later on. It is a prolonged process and not a matter of few days. Repeated tests would have to be carried out to determine how successful the surgery, the radiation or chemotherapy therapy have been. Based on the reports the trajectory of the further treatment would be derived. Throat cancer complications after the surgery and treatment could include disfigurement of neck and face primarily. This though can be fixed to a certain extent through surgery. The other issues that a patient may face during recovery includes breathing and swallowing difficulty, trouble while speaking and skin hardening around the neck. Cancer of any kind is a condition which if caught hold of early on can be treated and many a times completely eradicated but this requires you to be alert and keep a eye on your health like a hawk. Regular health checkups are advisable for the same. This entry was posted in Healthcare and tagged ayurvedic hospitals in bangalore, best cancer hospital in bangalore, best cancer hospital in india, Cancer center in Bangalore, cancer Hospital in Bangalore, hospitals in bangalore, throat cancer, throat cancer causes, throat cancer symptoms on September 26, 2017 by admin. 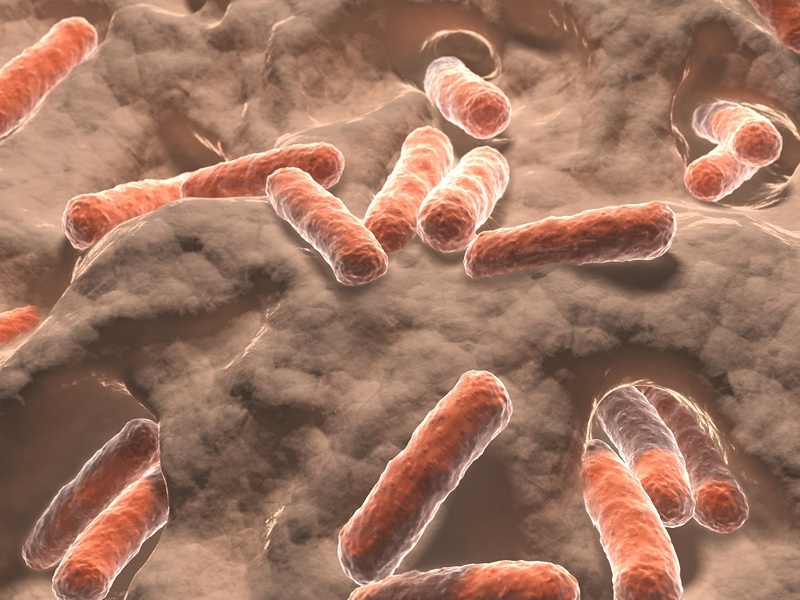 Gut bacteria in the years to come can help reduce the effects of aging, rather could be of great help in slowing down aging process. This could be possible with the help of supplements derived from gut bacteria. These bacterial genes and compounds can also decrease the rate of tumor progression inside our body besides amyloid beta accumulation, a compound known to be related to Alzheimer’s disease, as per University of Texas Health Science Center. The scientists and researchers fraternity is well aware that the body interacts with millions of microbes called the microbiomes, inside the body. These microbiomes tend to influence the metabolic and cognitive activities as well as the aging process. Scientists at the Huffington Center are investigating on the possibility of importance of genetic composition of microbiomes for long life. An experiment was carried out on laboratory work C. elegans as doing it on mammals was quite challenging technically. The characteristics of C. Elegans are very much similar to that of human biology and are simple, transparent organisms with a short life span of upto 3 weeks. This aids in rapid collection of data. The experiment involved deleting one gene each from the 4000 genes at a time in an e.coli bacteria library to study the effects of each one. The researchers fed each individual mutant bacteria to the C. Elegans and then observed the worm’s life span closely. As per the researchers, out of 4000 bacterial genes that they tested, they deleted 29 of them and found that it increased the life span of the worms. Furthermore, they also noticed that, 12 of these bacteria restricted tumor growth besides amyloid-beta accumulation. Even purified colanic acid was provided to C. Elegans and showed increased life span in them besides fruit fly and other mammalian cells. They also found that colanic acid regulated the dynamics of cellular structures called mitochondria, responsible for providing energy to the cell. Well, based on the research that has been carried out and is being carried out, the researchers affirmatively suggest that designing supplements of the bacteria or their compounds could help slow down the aging process. This entry was posted in Healthcare and tagged ayurvedic hospitals in bangalore, best cancer hospital in bangalore, best cancer hospital in india, Best Neurologist in India, Cancer center in Bangalore, cancer Hospital in Bangalore, endocrinologist in Bangalore, full body checkup in bangalore, gastroenterologist in bangalore, gut bacteria, Knee Replacement Surgery in Bangalore, medical institutes in bangalore, panchakarma treatment in bangalore, rehabilitation hospital in bangalore, Urologist in Bangalore on September 18, 2017 by admin.